The mission cost approximately 2.5 billion dollars. It was scheduled for launch in 2009 but various delays forced NASA to abort that goal. The optimum launch window when Mars and Earth are in the relative position that makes the trip as short as possible occurs every two years so two years after 2009 it is now the time for launch. The primary mission will last one Martian year (98 earth weeks) and if the rover is operational it could be further extended for much more. Landing sequence is scheduled for August 2012. 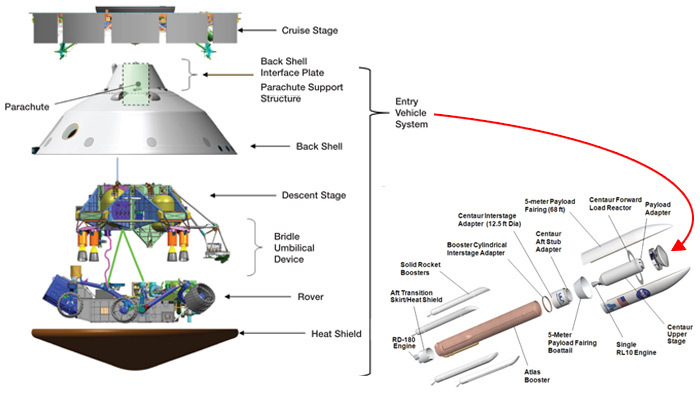 The system is comprised by the rover, the descent stage and the two parts of the aeroshell, the back shell and the heat shield. The later is the largest one that has ever used for a capsule atmospheric re-entry. It is larger in diameter than the one used in the Apollo spacecrafts and it is covered by phenolic impregnated carbon ablator (PICA) tiles able to withstand the peak temperature of 2.100C. The Curiosity rover is a scaled-up version of the design used in the Sojourner, Spirit and Opportunity. It has six wheels, each powered by a hub brushless electric motor and four of them, 2 in the front and 2 in the back, can be steered independently. The chassis is suspended via a rocker-bogie system, the preferable for all NASA rovers. This allows the rover to stay almost level in uneven terrain and it provides stable movements to the very slow moving rover. Instead of solar cells the MSL uses a thermoelectric radioisotope generator (multi-mission radioisotope thermoelectric generator - MMRTG) that converts the heat emitted from a pellet of radioactive Plutonium-238 dioxide to electricity via a set of solid-state thermocouples. It is much simpler and compact (it weighs only 4.8kg) than a nuclear reactor and of course much safer (personnel that worked on it received negligible amounts of radiation). NASA calls it a ‘nuclear battery’ and apart from electricity it also provides heat for the electronics inside the vehicle’s cell. MMRTG could power the rover for years. Lithium-ion batteries are charged by this generator and provide peak current when needed in conditions that exceed the maximum power provided by the MMRTG. The main objectives of the mission are the evaluation of the habitability of the planet, its ability to host life, the preservation of it and the study of past and present environments. 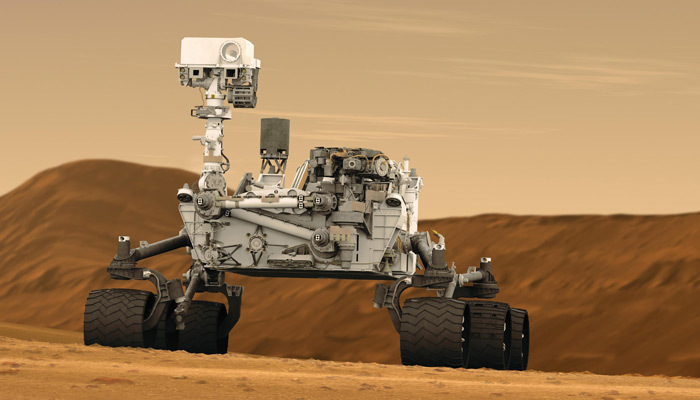 Curiosity has on board the most advanced set of cameras and scientific instruments ever sent on Mars. 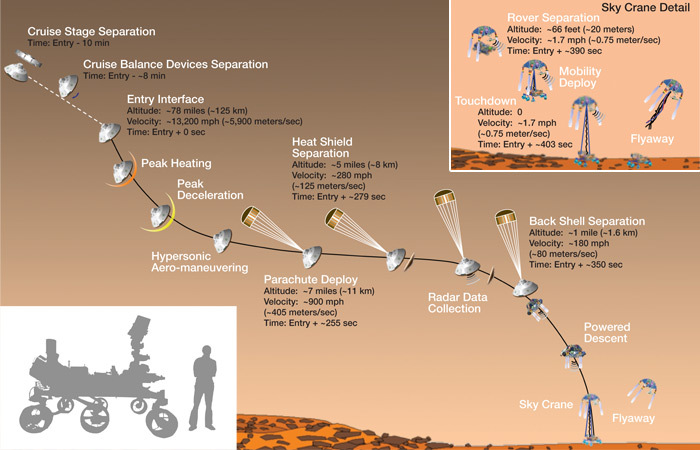 Curiosity will use a very innovative delivery system. Apart from being the largest interplanetary aeroshell ever used, the MSL capsule will be able to actively change its trajectory for the first time. While entering the atmosphere, tungsten ballast will drop off, thus creating an asymmetrical center of mass. That introduces an angle of incidence and by controlling the yaw of the aeroshell via the reaction control system installed on the backshell the spacecraft can modify its trajectory and glide almost like a winged aircraft. At mach 2 the heat shield is dropped and a parachute (the largest ever used in such a mission but similar to the ones used before) is deployed. Without the heat shield the downwards facing radar and landing systems are operational and at a lower altitude the parachute and the backshell are dropped while the deceleration is now provided by the final descent stage. This uses four pair of fully throttleable engines (derivatives of those used in the Viking missions) and it is able to position the craft over the desired landing spot. HD images from Mars Reconnaissance Orbiter help avoid rocks and rough terrain with great accuracy. At a very low altitude the rover is deployed through a system of cables and an umbilical cord with a specific rate controlled by a mechanical system that doesn’t allow it to spool very fast or too slowly. The relatively low landing impact is absorbed by the suspension and the descent stage is detached and crashed at a far distance. This innovative sky crane system solved the problem of propulsive landing of a rover. The 3 previous rovers were landed via airbags but the Curiosity is too big for that and placing the rockets below the rover (similarly to other propulsive landing but static missions, like the Vikings) would overcomplicate the rover deployment. Sky crane was not very popular initially in JPL but extensive study and tests established it as a sound solution. The chosen landing spot is the Gale-crater, a very tricky place for unpropulsive landing but accessible with this new much more precise method. This area is believed to be very interesting geologically and Curiosity will explore a significant part of it. Scientist and engineers from JPL don’t seem to worry about the complicated landing procedure because of the very extensive tests. However there is always the risk of some software bug or small glitch that could endanger the mission. Everyone hopes that MSL starting from August 2012 will be able to continue the very successful missions of previous rovers. You can find more on the MSL NASA mission page and at these official documents for MSL Curiosity.